Though the months of long runs and speed work are behind you, in the days before your goal marathon, there is still plenty you can do to make or break your race. Here are answers to some of the most frequently asked questions about those critical days leading up to race day. Should I run the day before the race or rest completely? It’s up to you. While some people like to fully rest in the days before the race, others like to run 1 to 2 easy miles to shake out sore muscles, burn off the nervous energy, and just get revved up to run. There’s no universal best answer that applies to everyone. You have to figure out what strategy is going to be best for your state of mind and your body. If you do run, be sure to keep the effort easy and the workout short. It is way too easy to let prerace jitters get the best of you; resist the temptation to run all out or go for a long workout. This won’t increase your fitness; it only increases your risk of injury and drains the energy you need for race day. Just remember: All the energy you save in the days leading up to the race is all energy you can use beyond mile 20 of the marathon, when you’ll need it the most. If I have been strength training, when should I cut back? According to Runner’s World Challenge injury expert Adam St. Pierre, exercise physiologist at the Boulder Center for Sports Medicine, it depends largely on the type of strength training you do. In the 2 to 3 weeks before the race, you might keep up the workouts but lower the number of reps you do. In the week before the race, you probably want to stop strength training all together. You can continue to do core and mobility work right up to the race, but it’s not a good time to add new exercises or routines. I am a first-time marathoner whose goal is to “just finish,” what is the best way to approach the race? Consider the race as a celebration of all the hard work you did to get to the starting line. No matter what the finish line clock says, at the end of the day you will have accomplished something that many people just spend their lives dreaming about. You should savor that experience. Focus on running your own race. You can’t control the weather, but you can control the quality of your experience. Focus on getting into a rhythm and sustaining a pace that will help you finish feeling strong. Don’t get caught up in the competitive vibe of the pack, or get freaked out by the numbers on the sideline clock or on your watch. You don’t want to miss the experience because you’re so stressed about finishing in a time that you— or anyone else— considers respectable. We see so many people who start training but never make it to the starting line because of injury, busy work and family life, or just loss of motivation. It is a major accomplishment to make it to the starting line. Treat the race itself like a celebratory victory lap. 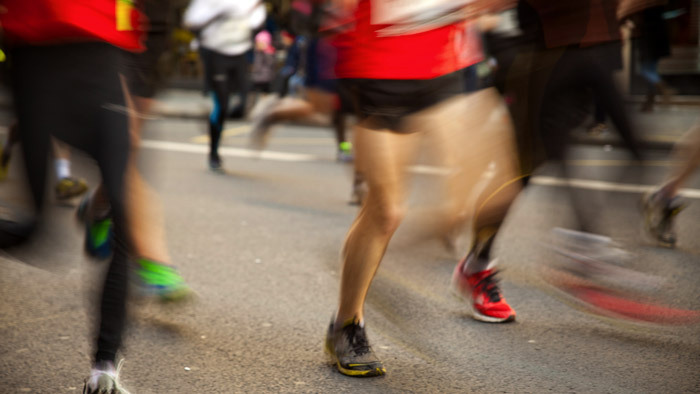 What is the biggest mistake that runners make in a marathon? Going out too fast, going out too fast, going out too fast! Do not try to “bank time”; that strategy always backfires. Think about running a negative split, covering the second half of the race faster than the first half, and gaining energy and speed with each step closer to the finish line. You want to cross that line pumping your fist and feeling victorious. You want to savor this success. Do not shoot yourself in the foot by going out too fast and having to walk, crawl, or suffer to the finish line. How long should I wait to start running/working out again after I’ve completed the marathon? Unless you are injured, get moving the day after the race. You will feel stiff and like your legs are attached to your body backward, but it’s best to hop on the elliptical machine, get in the pool, or even do a short 1- to 2-mile easy run just to get the blood circulating to your sore muscles. Counterintuitive as it may seem, it will help you feel better sooner. Rest fully the next day or two, and then keep up the cross-training and easy running throughout the next two weeks. We have a great marathon and half-marathon recovery plan, which you can get here.